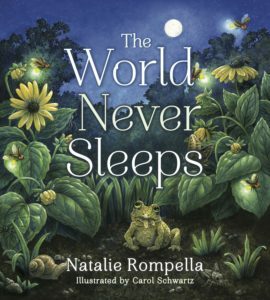 I am excited to announce that my new picture book, The World Never Sleeps is officially out! 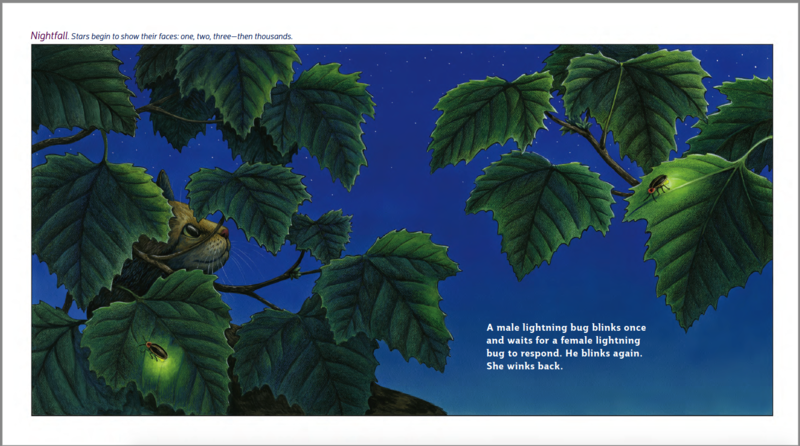 3. the author and illustrator do not consult on the illustrations. While doing author visits, students often ask questions about the illustrations, which I’m unable to answer. It also made me more curious about the illustrator of The World Never Sleeps. I thought it’d be fun to get to know her a little better. 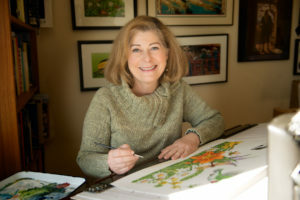 Meet Carol Schwartz, illustrator of over sixty books, including The World Never Sleeps. 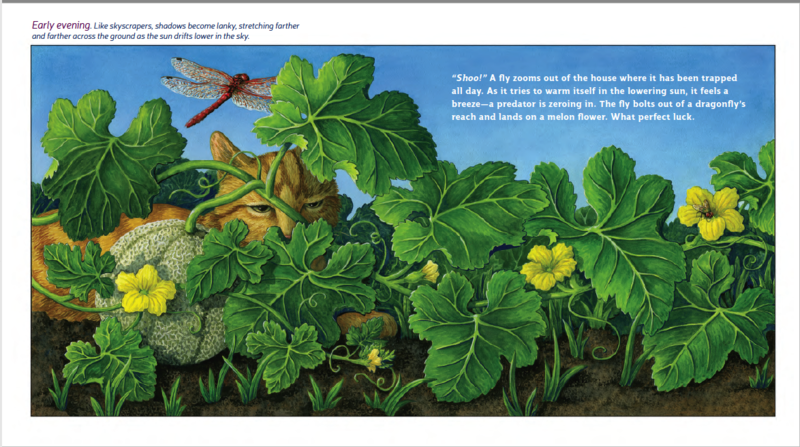 You added the surprise of a cat in each illustration (which students have loved seeing!). Can you tell me the story behind that? As an illustrator, I am hired by a publisher to stay true to the manuscript while also augmenting the story with a visual experience. In The World Never Sleeps my vision was to find something that would unite the times of day which are so beautifully portrayed on each page. Finding a character that could be awake at various times of day or night was right in my lap, my cat, Milkshake. Not only did she serve as a somewhat willing model but also as a friendly pet that many children could identify with and enjoy finding in each scene. How much direction does a publisher give you on what they want for illustrations? For instance, do they tell you to use a particular style? A particular color palette? My experience is different with each publisher and with each book. Initially, there is great freedom to be creative. Sometimes I discuss my ideas before offering the first set of sketches. There are always revisions. It is part of the process. The publisher chooses a particular illustrator because of their style. Typically, they don’t dictate style. I would shy away from a book if I were asked to draw or paint in a style that wasn’t mine. I imagine there could be a circumstance where a particular color palette might be suggested or agreed upon. I can’t remember that happening to me though. Are you an insect person? What’s your favorite insect to look at? What’s your favorite to illustrate? I have always been fascinated with insects. I love the shapes, patterns and colors of insects and learning about their seemingly secret lives. They are so interesting! I like being able to identify insect when I find them. When we know a little bit about insects, they are not so scary. Beetles are my favorite insects, although who isn’t in awe of a praying mantis or a butterfly? My favorite insect to illustrate is any that have intricate patterns and colors. Regardless, are you able to do illustrations for a subject you don’t like? It is the job of an illustrator to illustrate any subject that comes their way. Sometimes I have to work hard to find something about a subject that sparks my imagination, but I have to find it. Otherwise, my illustrations won’t be interesting. I really don’t like ants in real life. They are annoying and some, like fire ants, I find dangerous. I am allergic to their stings. I also find them extremely interesting and admire their social structure and sheer numbers. 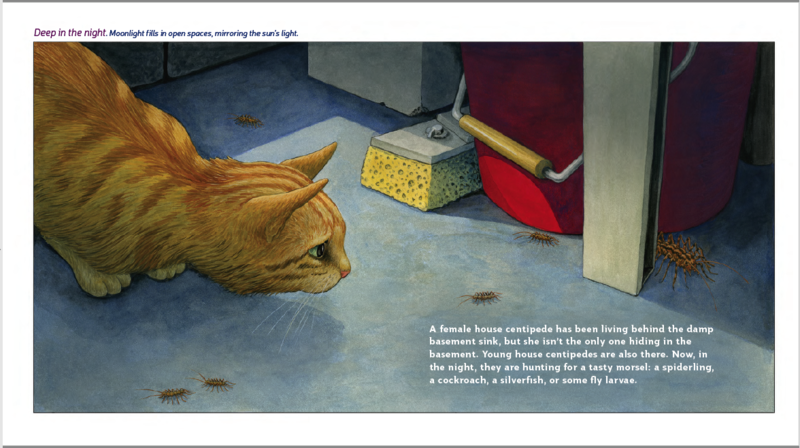 I’ve had to illustrate two books about ants. I’ve also illustrated two books about bats. Some of them are really ugly, while others are kind of cute. What kind of research did you do for The World Never Sleeps? Most people are surprised at how much research I do for a book. For example, I chose a buckeye butterfly for the midmorning sunflowers spread. The purple flowers in the scene are toadflax, which is a host plant for the buckeye. Especially in a nonfiction book, I strive for facts to be correct so I ask a lot of questions. Not much is arbitrary. I look at tons of images online. I gather images that show a subject from different angles so I have a good idea of its three dimensionality. Finding a real life subject to draw or photograph is best. I like having my own photos to work with. The Black-eyed Susans on the cover are from photographs I took at night where I live. I have an ever growing library of photos I’ve taken that I often use in my work. I also have a modest collection of dead insects which is great for studying details. 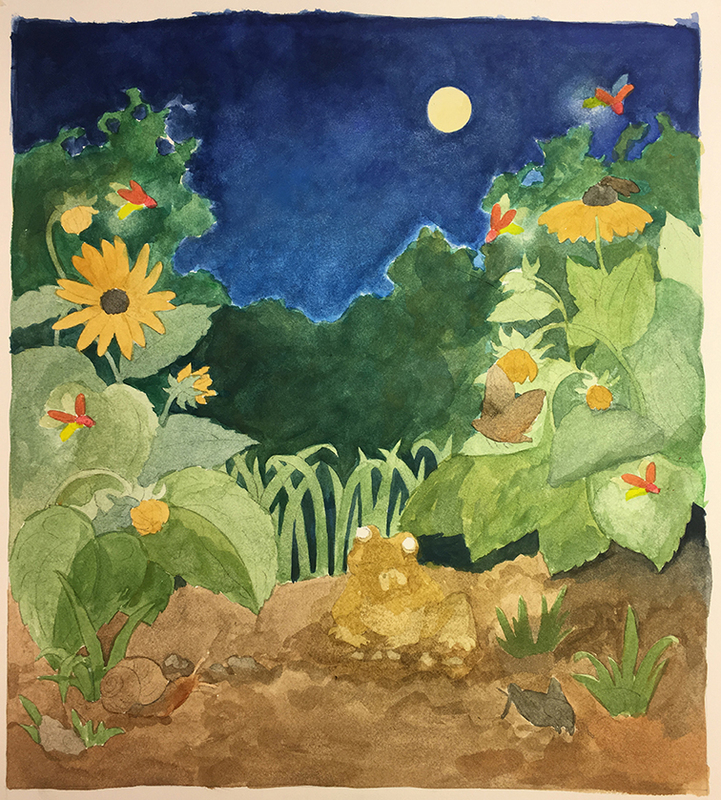 I used my bees and dragonflies to draw from for a few of the spreads. I start by sketching small thumbnails of each page, then sketching full size pencil sketches on tracing paper. Tracing paper gives me flexibility for making changes easily. After I get approval for the sketches, I transfer my pencil sketches to Strathmore 3-ply Bristol Board and begin painting with gouache, an opaque watercolor. I then scan my artwork on my large format scanner and continue to work on each one in Photoshop. Whatever needs to be done, whether it’s deleting or adding, smoothing brush stokes or adjusting color, Photoshop makes change easy. Which illustration was the most difficult? Why? The cover was difficult. Most covers are challenging because they have a big job to do. A cover has to grab attention, work well with the title and say something about the story without giving away too much. I can’t even count how many versions I sketched. Originally, there wasn’t a cat on the cover, then it was decided the cat might be a selling point. I had to use the magic of Photoshop to add the cat to an already finished illustration. Setting the stage for the interior illustrations was also a process. I imagined a whole house and yard and what it looked like and how parts were connected to each other. Then I had to image a nearby field of soybeans and a pond. 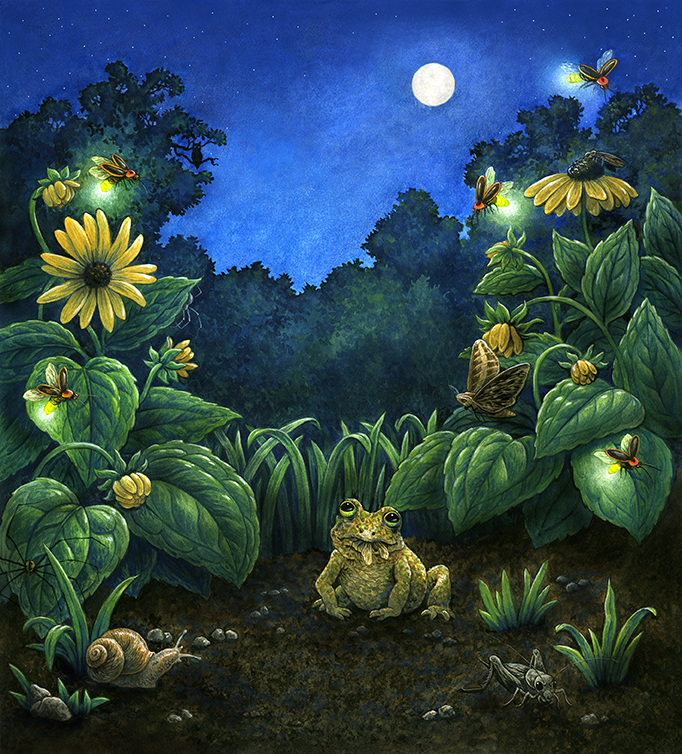 I imagined a summer day and night where flora and fauna would be growing, blooming, living. I have an educational project I’m working on at the moment and waiting for the next book project. What topic do you hope to illustrate some day? I would like to perhaps write and illustrate a picture book about the health of our oceans. Hearing that by 2040 there will be more plastic than fish in the ocean is very distressing. The more aware we become and care about a problem, the more we are willing to do something about it. 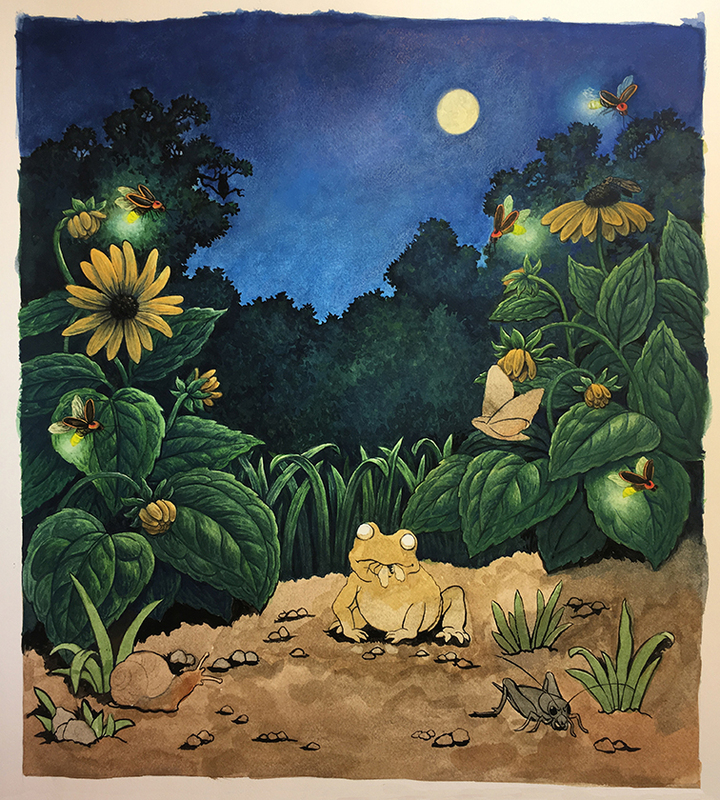 To see more of Carol’s artwork, go to www.csillustration.com and to join her on Facebook, go to https://www.facebook.com/csillustration/. The World Never Sleeps is available through Amazon and indiebound.